Desc: Sterling Silver horseshoe with cross in center dangle earrings. 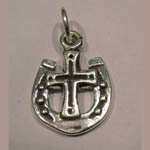 The horseshoe has great detail work and the cross has antiquing along the center for affect. The earrings are open between the cross and the horseshoe and has a bright polish finish. The shepard hooks are fashioned from Sterling Silver. We also have a matching pendant, see SK361.